I went to Sugamo Jizo Dori Shopping Street. 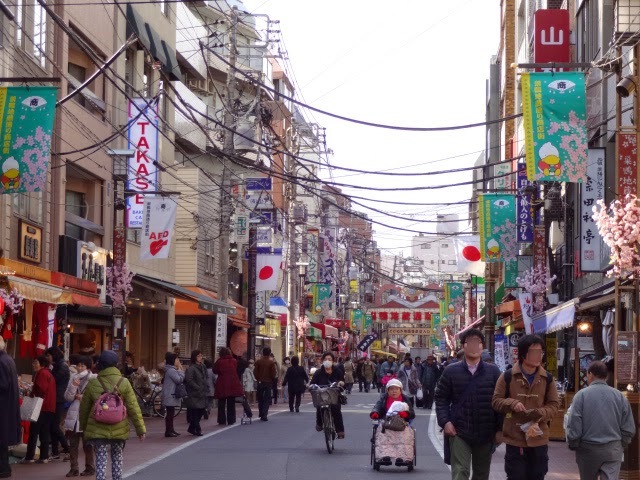 Sugamo is called Many elderly people visit this area. The street has 800 meter long and there are "Grandmas' Harajuku". over 200 stores. They sell clothes, traditional foods and traditional crafts for elderly people. Many stores have a food sample. A food sample is real food., not plastic food sample. I tried to have dried young sardines and shrimps . They was so nice and I bought them. I also try to drink green tea. It was so tasty. I do love green tea. They have many kinds of rice cracker. These umbrella were so beautiful. We can enjoy a depressing rain day. They sell red under ware. The color red is believed to be healthy. The red color is increasing blood circulation and body temperature. I didn't buy red under ware but I bought the red towel with my Animal symbol "Eto" monkey.